The Xyron 500 Create-A-Sticker turns almost anything into a sticker. Simply feed the item in, turn the handle and trim. Applies an even layer of Acid-Free Permanent or Acid-Free Repositionable adhesive to items up to 5" wide. Includes a 5" wide x 20' long, acid-free permanent adhesive cartridge and idea book. Dimensions: 8.38" x 9.38" x 6"
I really like this it is easy to use and much better than glue. Wonderful addition to my crafting tools! Makes it so easy to adhere intricate does that I am able to make more cards than ever. It came quickly and in perfect shape. Highly pleased with the product and service! I love this machine. I am a greeting card creator and this little machine will come in real handy. It was a good price and the delivery was fast. Thank you. Loving my Machine So Far So Good! My Brain just goes Wild with Ideas!!! I like my new Xyron create a sticker. It works great. I purchased the refill to have on hand when I need it. I anticipate that I will be using the sticker maker a lot and don"t want to wait for a refill to come in the mail if and when I run out of the first cartridge. I just ordered a replacement. This is my 2nd one. I used mine a lot and my crank broke. I glad I found this sight so I can keep myself in supplies. I love this small machine! Its very easy to use just the right size and not have a lot of waste like other sizes or machines. Glue sticks are just not as secure as the 100% sticky back that this little thing provides. Transcript: This is the Create-A-Sticker Max, by Xyron! It’s as easy as inserting anything no thicker than a coin into the front, and slowly turn the knob. You can create multiple smaller stickers at a time as well! The project will come out the back on the tacking sheet. Pull the sheet up to tear it off. Now, all we have to do is peel our new sticker off and stick it to anything! It’s really that easy to make your own sticker. It will add an adhesive back to most any flat material. This model has some fun designs on it too, so it can be as fun as some of your own creative projects. This is the Create-A-Sticker Max, by Xyron! On the bottom are four rubber pads, which do a decent job holding the unit in place. You’ll see that when you tear off the tacking sheet, it tears like a giant tape dispenser. There is no heat, no electricity, no mess, and it is refillable. You’ll see on the front it says what cartridge is in. If you want to change it, pull up on the top blue tab. From there you can simply pull the cartridge out. There are two types of stickers you can use, ones with permanent adhesive, or stickers that peel off a little easier at the start but become permanent with time. When we choose our next cartridge, it’s just as simple to slip it in place. Then pop the cover back on, and you’re ready for more stickers! Hi! I’m Beth Kingston and today I’m going to talk to you about the difference between the Xyron 5-inch Creative Station and the Xyron 5-inch Create-a-Sticker. Outside of their color and logo, there are a few subtle differences that I want to talk to you about so that if you’ve already got one at home, it will help you figure out which kind of refill you need to buy or, if you’re thinking about getting one, it will help you decide which one is best for your needs. The biggest thing that I noticed right off the bat is the way you turn the handle, in this case, or we have a knob on this side. If you look on the back, the Create-a-Sticker has ridged edges so that you can just tear off your paper. If you’re using the Creative Station, it’s actually got a little blade that you slide along and it cuts it for you. When you’re inserting items into your machine, you’ll notice that there is no top coating on the Create-a-Sticker. So that actually peels back up into the machine so you don’t have anything to rub and peel. You just set it down and peel off your project. If you’re using the Creative Station, you can see that there is our clear film and you’ll rub and peel. And then you peel this off and set this aside. And so that’s another big difference about the adhesive inside. The refills look different. On the Create-a-Sticker, it’s actually a square refill. I’m actually going to stick them both out so you can see the difference. On the Creative Station, it’s rectangular. The boxes are also different size as well. So if you have a Create-a-Sticker, you’re looking for a square box. If you have the Creative Station, you’re looking for a rectangular box. The easiest way really to remember which is which is the Create-a-Sticker makes stickers, obviously. The Creative Station makes stickers but it also does a variety of other things. We’ve got laminate magnet refills, we’ve got double-sided laminate, we’ve also got a combination laminate adhesive refill for this. So it is an all-in-one Creative Station. The Create-a-Sticker makes stickers. Super easy to remember. There’s a little bit of a price difference but those are the basic differences between each machine, and I hope that has helped you to make some decisions. In addition to their terrific professional-grade laminators, Xyron makes a lot of great crafting gadgets, including the items in their Create-A-Sticker series. 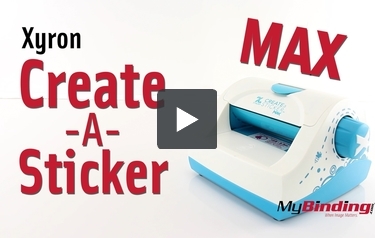 These devices make it possible for anyone to create his/her own stickers and labels for use in scrapbooks, greeting cards, correspondence, and more. The biggest product in this line is the 500 model which is easy to use and affordable, in addition to being one of the safest crafting tools out there. However, it does have one major drawback which is mentioned below. Keep reading to learn all about this product and then decide for yourself if this is the right device for you. This is the largest of Xyron's three label-making machines. It can produce labels that are up to 5 inches wide, while the 250 and 150 can only produce items that are 2.5 and 1.5 inches wide, respectively. Kids would probably have a lot of fun with this machine because it's easy to use. Also, the 500, like the other Create-A-Sticker products, stands on its own and doesn't need an outside power source to be used. That way, it's safe for everyone to use, even the little ones. This device is small and not heavy. It is easy to move around. How do you change the cartridges? Thank you for your question. 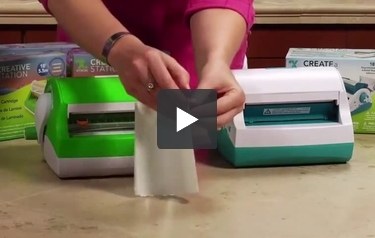 In the demo video on the product page for the Xyron Create-A-Sticker Model 500 it shows the process of swapping out the cartridges. please provide info on ordering replacement cartridge (repositionable) for Create a Sticker MAX. Cannot find on website or stores. Thanks! Thank you for your question. You can find the Xyron Create-A-Sticker 500 Repositionable Refill Cartridge here . Where do I purchase extra cartridges for the "Create a Sticker Max"? Thank you for your question. We have 2 types of replacement cartridges available for the Xyron Create-A-Sticker Model 500. It is avaible in either a Repositionable Refill Cartridge or Permanent Refill Cartridge. You can find both here . Does this have cartridges? How does it capture the image you want? Thank you for your question. The Xyron Create-A-Sticker does not "capture a image" , it places adhesive on the back of the piece paper that you want to turn into a sticker. The Xyron Create-A-Sticker comes with one cartridge and refills are available to purchase separately.